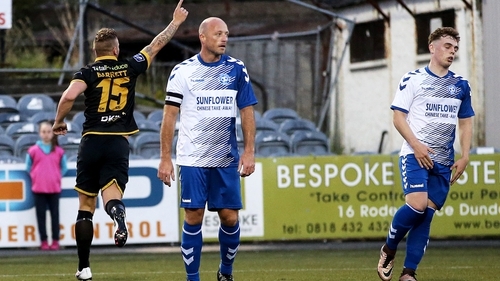 Dundalk cruised into the quarter finals of the FAI Cup with a commanding display against Leinster Senior League side Crumlin United at Oriel Park. Lilywhites boss Stephen Kenny understandably rotated his squad but he still named a strong XI with new signings Alan Keane and Dean Shiels coming in for their first starts. Goalkeeper, Gary Rogers, who earlier in the day was called up to the Republic of Ireland squad, was named on the bench. Despite the changes, it took the cup holders just eight minutes to click into gear. Ciaran O’Connor went past Ciaran Kenna on the right and when his pull back was dummied by Robbie Benson, Chris Shields arrived right on cue to curl home a stunning left footed effort from just outside the penalty area to claim his first goal of the season. Dundalk continued to press forward and some good interplay between the lively Carlton Ubaezuono and Shane Grimes on the left almost opened the Crumlin back four open again but Ciaran O’Connor just couldn’t divert the full back’s cross into the net. Paddy Barrett then found himself in acres of space at the back post but misjudged a Benson free-kick and Ubaezuono then cut in from the left to let fly with a vicious effort that Stephen Conlon did well to tip over the bar. The pressure eventually told on the non-league side in the 25th minute. Centre-back Paddy Barrett took a Benson free kick down on his chest before rifling home, via the post, like a seasoned centre-forward. The non-league side did fashion a half chance in the 32nd minute but Dean Hurley’s weak attempt was easily gathered by Gabriel Sava. Conor Murphy then couldn’t control Carl Forsythe’s dangerous cross from the right after finding himself a yard of room in the Dundalk penalty area. Kenna was fortunate not to turn a Grimes cross into his own net in the 39th minute, the ball spinning just off target. From the resulting Shiels corner, Barrett saw another volley deflect off Ian Coone and crash back off the woodwork. The tie was all but put to bed right before half time. Shane Grimes broke on the left and when Ciaran O’Connor stepped over the subsequent cross, Shiels stroked the ball home in style to open his account for Dundalk. Dundalk eased up in the second half and they were given a scare when Benson limped off with an injury just shy of the hour mark. Ciaran O’Connor should have made it four nil in the 68th minute but he just couldn’t divert Ubaezuono’s delicious cross from the left past Conlon. His younger brother made no mistake six minutes later, however. Alan Keane delivered from the right and Michael O’Connor rose to power a superb header past Conlon. Ubaenuozo continued to impress, picking up the man of the match award, and he picked out Shields at the near post in the 78th minute, the skipper for the night hammering home his second of the night and Dundalk’s fifth to set up a last eight showdown with First Division side, UCD. Crumlin United: Stephen Conlon; Carl Forsyth, Noel Murray, Ciaran Kenna (Stephen Kelly 71), Ian Coone; Daniel Kelly (Daniel McGuinness 60), Luke Kelly, Brian Mooney, Alan McGreal; Conor Murphy; Dean Hurley (Noel Cummins 86). Dundalk: Gabriel Sava; Georgie Poynton, Alan Keane, Paddy Barrett, Shane Grimes; Chris Shields, Robbie Benson (Brian Gartland 58); Michael O’Connor, Dean Shiels (Sean Gannon 85), Carlton Ubaezuono; Ciaran O’Connor (Keith Dalton 70).